Chuck Wagon Chow- Piping hot! Start by browning the ground beef in a large skillet. Season with Salt and Pepper if desired. 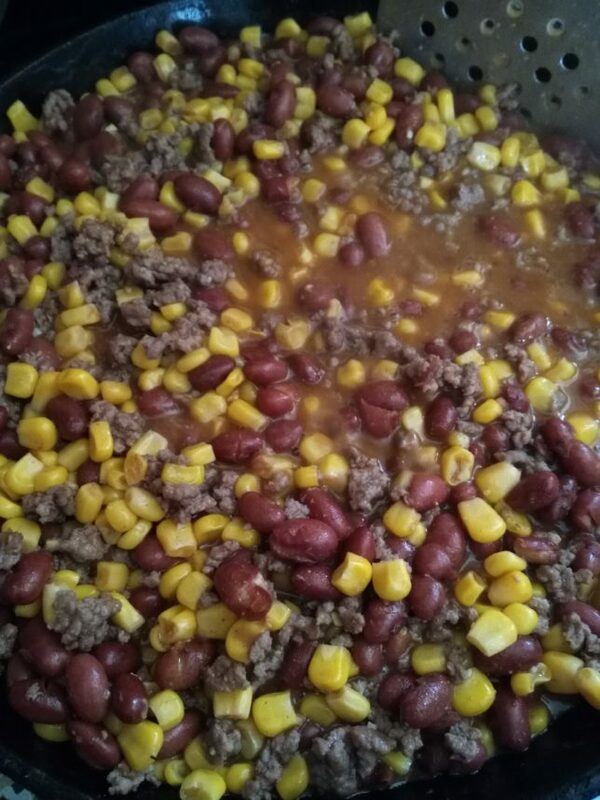 Drain excess fat from pan and add the whole can of chili beans, liquid and all, and the corn. Stir. Now that it is mixed up, season with the garlic (this might take more than you think, so check it a couple times as it seems to change as it heats up and melds together. Also depends on how much flavor your beans have). The liquid from the chili beans adds the rest of the flavor. We used to eat this with garlic bread back when I could have such things. These days the kids will sometimes eat with bread and butter, but normally it is just on its own. Over the years I have started adding a second can of corn and beans to stretch this meal as my kiddos have gotten bigger and we needed more to make a complete meal and no one complains about a lack of meat in the dish. Can’t do much to beat a quick, simple, and hearty meal with your family.